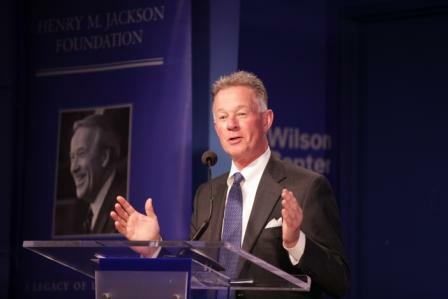 This week marks 20 years for me at the helm of the Jackson Foundation. 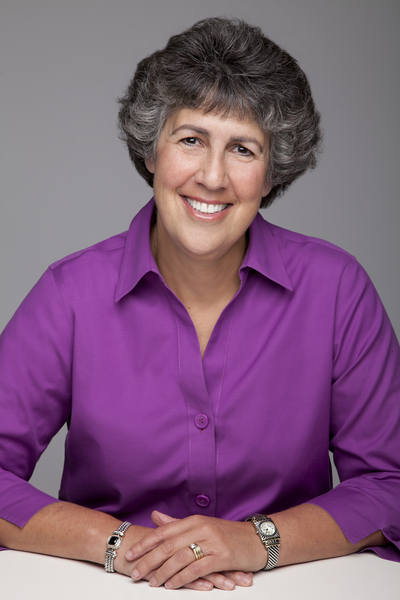 I’m proud and honored to have served as Executive Director for two decades. During my tenure, I’ve had the good fortune to work with my dedicated Board members and great staff on any number of meaningful activities. My personal highlight reel includes a 1995 Jerusalem conference celebrating the ground-breaking Jackson-Vanik Amendment — which helped over a million Soviet Jews emigrate from the USSR. That conference attracted hundreds of Soviet Jewish emigres now living in Israel as well as a host of Israeli and American politicians, including the late Prime Minister Itzhak Rabin, who was assassinated only months later. Since I wrote my Master’s thesis on Senator Jackson’s legislation and the story behind it, that conference had tremendous significance for me. 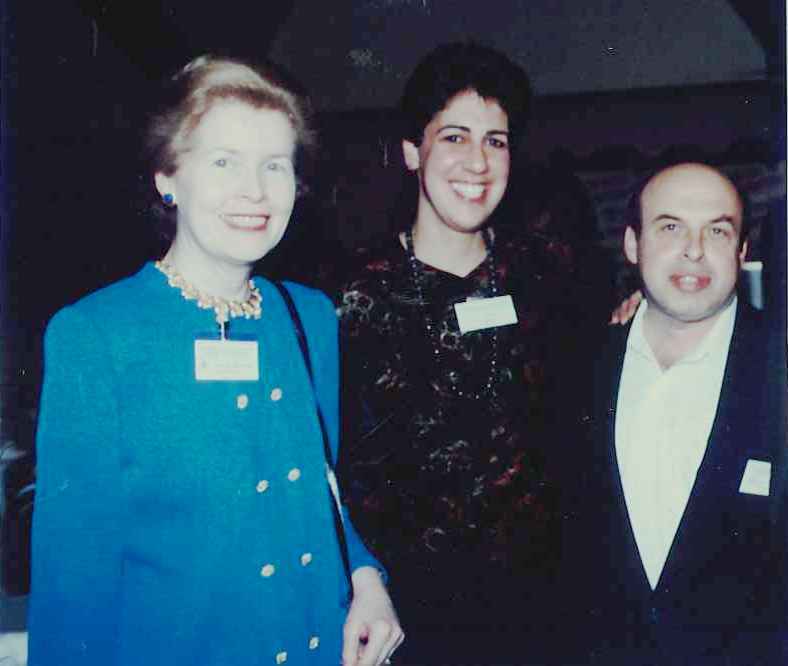 The famous Jewish dissident from the Soviet era, Natan Sharansky, worked closely with us on the conference, and our Chairman, Helen Jackson, joined us in Jerusalem. It was unforgettable. I’ve also reflected on the role that the Foundation has played to strengthen the Jackson School at the University of Washington. 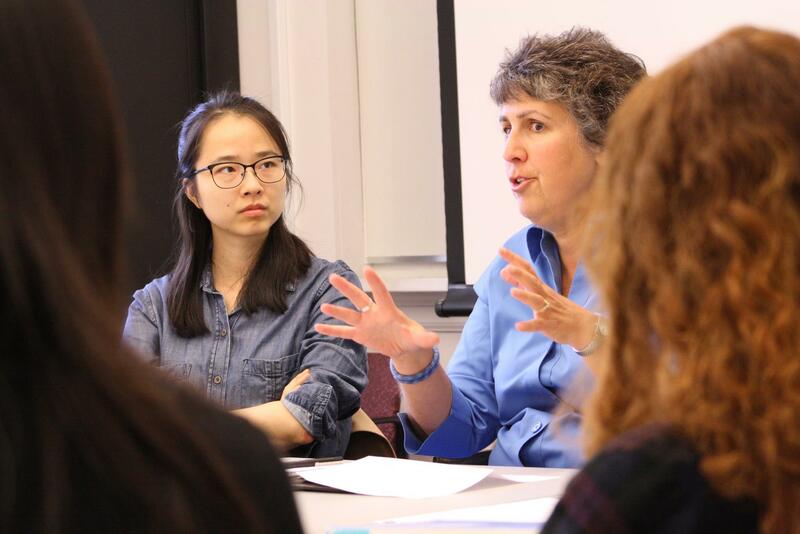 Dozens of policy conferences, graduate fellowships, the Jackson Professorship, the Golub Chair, lecture series, the new PhD program, the Helen Jackson Chair in Human Rights – we’ve helped usher in key changes at the Jackson School. As a graduate of the School, it has meant a lot to me to help the University do what it does best: provide first-class education to young people, in this case our future leaders in international policy. It has been a richly rewarding relationship, one that makes me highly value the intellectual depth of the faculty at the Jackson School. Lara meets with Jackson School graduate students this fall. We started supporting human rights in Russia over 20 years ago – after the break-up of the Soviet Union. In the more than two decades since, we’ve watched the ups and downs of civil society in Russia with alarm, and our grant making and programs have changed dramatically in response to events. That’s a sadness to remark upon, given the downward trend in rights under Putin’s Russia. We are still raising our voice on that front, however! 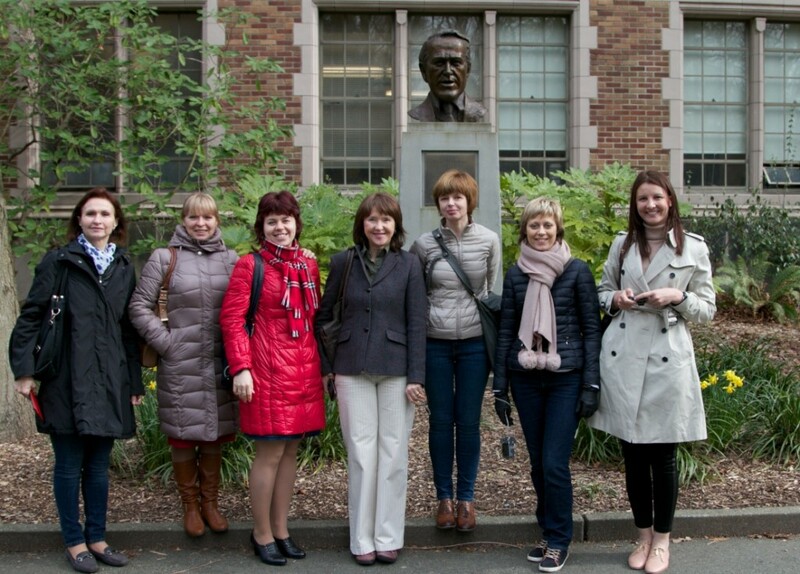 Last year we brought a group of civil society leaders from Russia to Seattle and Washington, DC under a grant from the U.S. State Department. This trip was inspirational for the delegation and continues to provide encouragement and ideas for these dedicated individuals back in Russia today. Lately we have two new programs which have galvanized the Board and staff: the first is helping to lend our resources and intellectual fire-power to the climate change world, focusing particularly on the national and global security implications for the U.S. around climate. The Jackson name lends credence and balance to discussions on this critical issue. We are helping to leverage our work by highlighting the military viewpoint and bringing other foundations to the table. This is a new area for me and it has been wonderful to be challenged to learn more about the climate field. Second, we have launched an initiative to train a new generation of Jackson-inspired young people, with the launch of the Jackson Leadership Fellows Program. It’s been invigorating to choose and begin to mentor the eight outstanding young professionals who comprise our first class here in Seattle. I’ve been energized by my interactions with each of them and feel it is one of the most exciting initiatives that the Foundation has embarked upon. It’s easy for me to think of the extended Jackson community as a family – one that includes our Board members, past and present, as well as former and current staff members of the Foundation, and “Scoop’s Troops” – those who worked with Jackson on his own staff or on one of his committee staff positions. It also comprises our many partners and grantees over the years, at the Jackson School, the National Bureau of Asian Research, the Kennan Institute, City Club Seattle, and countless other colleagues. It’s an engaging group and one that has a remarkable cohesion because of the respect for Senator Jackson that unites everyone. It has made this a great place to work. One thing I’ve learned at the Foundation over the course of the last twenty years– while the specific programs may change, the work in international affairs, environment and energy, human rights and public service still are highly relevant in today’s world. I look forward to working together with all of you to carry on the Jackson legacy. I hope you’ll get in touch. Our culture celebrates our sports heroes – from Michael Jordan to Derek Jeter to Kobe Bryant. We marvel at their ability to play on, through pain and years, achieving fame and success. Few of us have had the opportunity to publicly celebrate the careers of other, less famous giants in their fields. I’m delighted to cast the spotlight on one such unsung hero, Professor Kenneth B. Pyle, longtime historian and teacher at the University of Washington’s Jackson School of International Studies. Ken – retiring after 51 consecutive years of teaching, which certainly qualifies him for MVP – has won numerous teaching awards over the years. 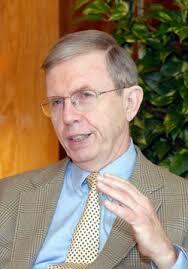 Equally important, he’s touched the lives and shaped the scholarship of thousands of young minds at the University. His students speak of him fondly, whether they now serve in the State Department or teach at other universities around the nation. I’ve had the good fortune to have had Dr. Pyle on the Jackson Foundation Board of Governors during my tenure on the staff. 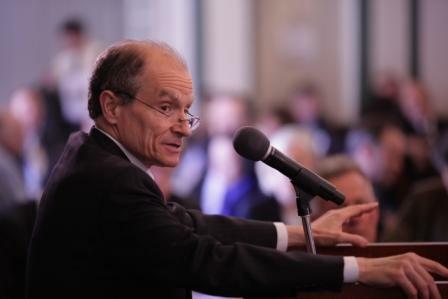 He was a founding member of our Board, having forged a close alliance with Senator Jackson in the days when Ken headed what was to become the Jackson School, and Jackson sought Ken out for advice on China and U.S. foreign policy toward Asia. Ken has spoken movingly of that seminal relationship, which began with Senator Jackson dropping by Ken’s office at the U.W. and peppering him with questions for two hours. Jackson and Pyle shared a concern that there was a national shortage of people who truly understood the workings of Asian and Slavic countries, and both believed that an immersion in the study of these areas was critical to achieve an understanding in U.S.-China and U.S.-Soviet relations. From that moment forward, Scoop and Ken collaborated – in enhancing international studies at the University, in traveling to China together in the early days of détente with China, and in mentoring young students. 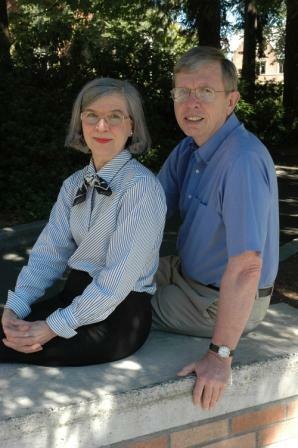 We at the Jackson Foundation value the role that Professor Pyle has played at the Jackson School and at the University of Washington for the past 50-plus years. We were delighted to name a recent professorship at the Jackson School in American foreign policy in honor of Anne H. H. and Kenneth B. Pyle out of respect and recognition of Ken’s major achievements in his field and his leadership of the Jackson School, and of his wife Anne’s integral partnership with Ken in that success.At the end of this month, there will be a public program to celebrate the career of Ken Pyle. We invite you to join us for this substantive program, featuring distinguished professor T.J. Pempel, University of California Berkeley, and many top-level colleagues from the Jackson School. Many of you have heard by now of the Foundation’s exciting new initiative – a young leadership program called the Henry M. Jackson Leadership Fellows. We’ve just launched the inaugural class of this 9-month program, which will include leadership training, mentoring, networking, and substantive work on individual projects. 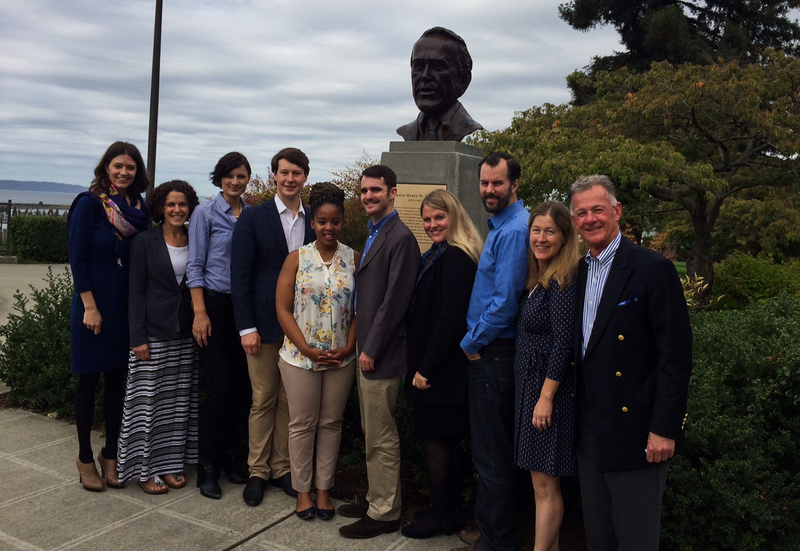 2016 Fellows with Anna Marie Laurence, Secretary of the Board, and John Hempelmann, President, in front of the Jackson bust in Everett, Washington outside the Jackson home. While we eventually chose only eight fellows, a few bright spots came through during the interview process. First, the candidates showed a tremendous interest in leadership – in all its facets – and a strong desire to learn the skills and attributes of great leaders. Second, they hunger to engage outside of work spheres and to connect more deeply with new colleagues and novel ideas. Third, these young professionals want to involve diverse aspects of our community into their work – both professionally and in their volunteer pursuits. Finally – and perhaps most heartening – they believe that Senator Jackson’s life and achievements can speak to this next generation. While many of the candidates did not previously know of Senator Jackson, they came to the interviews inspired by what they had read about him, especially in The Nature of Leadership book that we make available on our website. The Foundation embarked on its new Fellowship program in part to reach out to the next generation and inculcate them with the Jackson values. The year has just begun – and yet it is already clear that those values – and the man behind them – remain relevant today. We hope you will join us at some of the many events this year in which the Fellows will be involved. Sanctions as a Tool of American Foreign Policy: Do They Work? 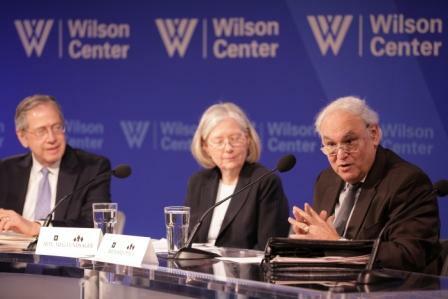 The Jackson Foundation and the Wilson Center’s Kennan Institute jointly sponsored a timely conference last week in Washington, D.C., focused on sanctions as a tool of American foreign policy: Do they work? Why are some sanctions more effective than others? When do they fail? What are the unintended consequences of sanctions policies? The conference brought some rigor to often politicized discussions about sanctions. Speakers assessed sanctions from a historical perspective in an effort to determine what has been effective and why. Panelists then explored current-day dilemmas facing Congress and the Executive Branch – specifically, Iran, Russia, and Cuba. A few themes emerged. One, voiced by Ambassador Daniel Fried, Coordinator for Sanctions Policy at the U.S. Department of State in his keynote address and echoed by others throughout the day, is that multilateral sanctions offer the most effective policy. Working together in coordination with other nations is the best recipe for success – with U.N. Security Council sanctions as the “gold star” of sanctions policy. When the U.S. and Europe joined together to sanction Russia for its Ukraine aggression, for example, that policy had a better chance of hitting the desired target. Least effective, on the other hand, are unilateral sanctions – think U.S. sanctions on Cuba. Second, sanctions historically don’t work well when aimed at regime change or at an authoritarian government. Those sanctions tend to spur a popular backlash in the country being sanctioned. On a panel I moderated that took a historical look at sanctions, Daniel Drezner of the Fletcher School of Law and Diplomacy at Tufts University called this “rallying around the flag.” And Ted Henken, of Baruch College, CUNY, a specialist on Cuba, quoted Raul Castro to this effect, “The more you punch us and kick us, mas revolucion,” he said. “Instead of promoting human rights and weakening the government, sanctions on Cuba have done the opposite,” Henken concluded. As John Hempelmann, Foundation president, said in his opening remarks, “the issue of sanctions holds special resonance for the Jackson Foundation, given the historic Jackson-Vanik Amendment. That legislation provided a new approach to foreign policy that explicitly linked America’s human rights ideals with economic relations through targeted sanctions on the USSR.” It also gave the sanctioned party a very clear path of what it could do to get sanctions lifted. Forty years later, we heard that sanctions with a very clear policy goal – and incentives to get them removed – will be the most likely to succeed. 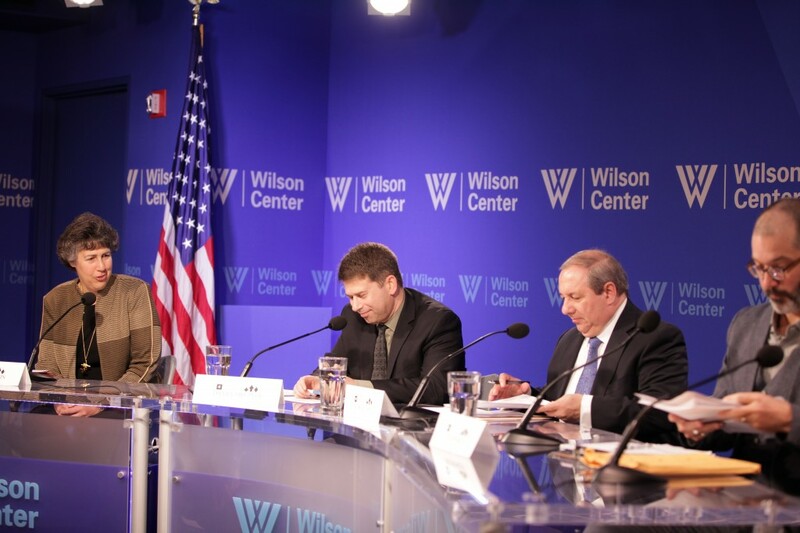 Following the event the Wilson Center conducted interviews with some of the panelists on their perspectives on sanctions. View them here. 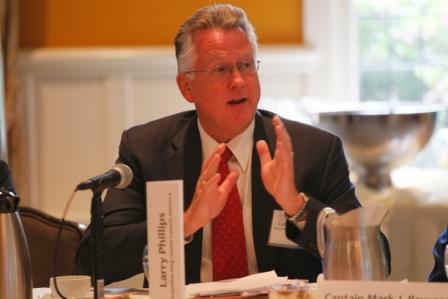 Larry Phillips, the chair of the Metropolitan King County Council here in Washington State, announced his intention not to seek reelection in Fall 2015. 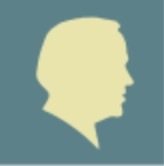 Larry, a board member of the Jackson Foundation, has shown outstanding leadership in our region. His role as an exemplary public official should be acknowledged. For two decades Larry has been active in transportation, clean energy and jobs creation, providing a reasoned, informed and highly competent voice for our community. Always energetic and passionate about issues, Larry has been an important leader in conserving the natural resources of the Puget Sound that we all value. We at the Jackson Foundation have been fortunate to have Larry associated with us as well. Two years ago Larry approached the Board with the idea of exploring the connection between climate change and national security threats, an emerging issue. Given the Jackson legacy in both environmental resource management and national security, this was a natural fit for us, and with Larry’s involvement, we have pursued this topic seriously. In June 2014 we partnered with the Pacific Northwest National Laboratory on a high-level symposium, “The Intersection of National Security and Climate Change,” which brought together 40 leaders from federal agencies, state and local governments, NGOs, business, and academia. Our report was widely disseminated. 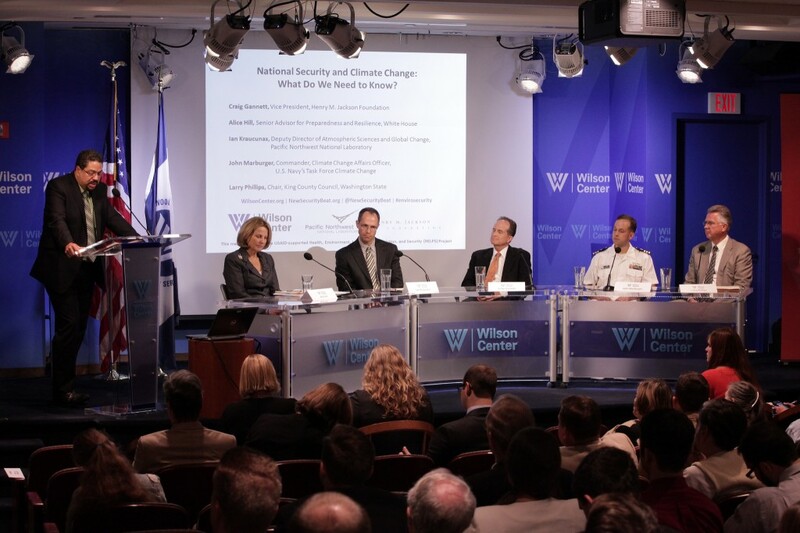 This past February we joined with the Center for Naval Analyses and its Military Advisory Board for an in-depth briefing to ensure that the military voice is being heard in the climate change and national security discussion and to advance the political process in the U.S. Later this spring we will convene other foundations nationally to inform them on the security implications of climate change. Larry was deeply engaged in these programs. We know that Larry will remain active as a leader in our region, but we will miss his voice in his official capacity as chair of the Metropolitan King County Council. 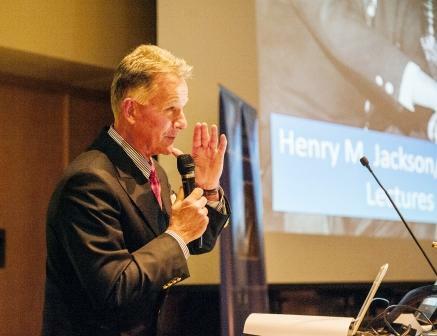 In an effort to showcase remarkable and effective leaders in all fields of our society, the Henry M. Jackson Foundation established the Jackson-Van Ness Lectures on Leadership series in 2009. 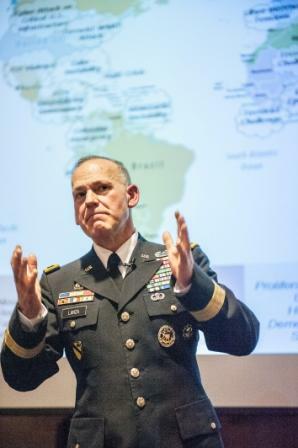 The latest lecture, featuring Lt. Gen. Stephen R. Lanza, commanding general of I Corps at Joint Base Lewis-McChord in Washington State, was inspirational and motivating for the packed crowd at the University of Washington. The lecture hall was filled with young people in uniform, the midshipmen and women of the University’s ROTC, as well as with other students, members of the community, and representatives from all of the armed forces. General Lanza, who has been described by the Secretary of the Army, John McHugh, as “a tested warrior, a proven leader, and an effective, tenacious commander,” is known for his dedication to his corps of soldiers. Lanza described the challenges facing military leaders: they make decisions involving conflict within a high-velocity environment. In order to be effective, military leaders must be able to adapt to change and unpredictable situations, such as the recent terror attacks in Paris, or the Ebola epidemic, or Ukraine-Russian fighting. A true leader will be empowered, engaged and accountable, while anticipating that his or her mission will change in dramatic and unpredictable ways, Lanza emphasized. General Lanza shared that the military is a valued-based organization. “I can’t recruit leaders from a head-hunter,” he said. “We have to build it from within.” That requires developing trust, character, competence and commitment. In answering a question regarding the balance between competence and character that Lanza referenced, the general stressed that competence can be taught, but character was essential in ensuring that the men and women of our nation’s military are able to respond effectively in the field as well as at home. We are pleased to share with you an audio recording of Gen. Lanza’s presentation and we will have a publication printed in the next few months. In the interim, we would also like to highlight two articles about the event; one, from the University of Washington Daily, and the other, from NorthWestMilitary.com news.